Every year, the IRS sets the maximum 401(k) contribution limits based on inflation (measured by CPI). There are actually multiple limits, including an individual contribution, an employer contribution, and an age 50+ catch-up contribution. If you’re currently working at a company with a plan, we highly suggest familiarizing yourself with its mechanics and any matching funds. Contributing to your 401(k) is an excellent way to help set yourself up for retirement. 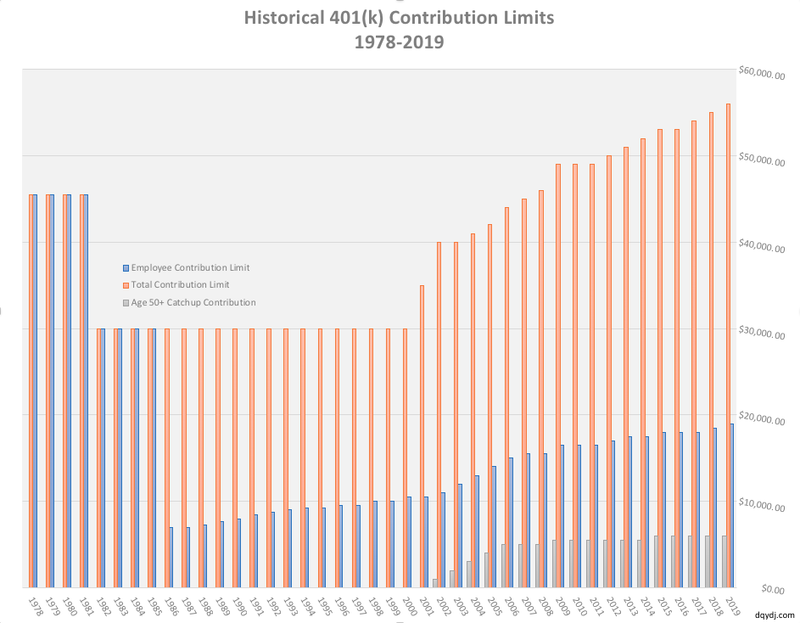 What is the 401(k) contribution limit in 2019? The 2019 401(k) contribution limit for an individual is $19,000. Additionally, employers can contribute up to $37,000 for a grand total limit of $56,000. If you are 50 years old or older, you can also contribute up to $6,000 in “catch-up” contributions on top of your individual and employer contributions. This is up from $18,500, $55,000, and $6,000, respectively, in 2018 contribution limits. The 401(k) was first introduced in the United States in the Revenue Act of 1978, amending the Internal Revenue Code. It started gaining wider adoption in November of 1981 when the IRS proposed regulations clarifying valid sources of income for 401(k) contributions. For a detailed history of the 401(k), the Investment Company Institute had an excellent presentation back in 2006 which summarized the history behind the plan. Following are some key laws which shaped the 401(k) and other deferred compensation plans, and left us in the current state. The IRS clarified the types of income that could be deferred into a 401(k) plan, stating regular earned income qualified and not just profit sharing income. The Tax Equity and Fiscal Responsibility Act of 1982 reduced the maximum allowable contribution to the 401(k) from all sources to $30,000 from $45,475. The Tax Reform Act of 1986 reduced the amount an individual could contribute to a deferred compensation plan to $7,000, while leaving the overall contribution alone at $30,000. The Economic Growth and Tax Relief Reconciliation Act of 2001 increased the contribution limit above $30,000 for the first time since 1981, and added the concept of “catchup” contributions for taxpayers 50 years old and older. If you find the 401(k) limit interesting, we also have an article detailing the history of the IRA Limit.